You see her crawling and laugh at how proud she is. 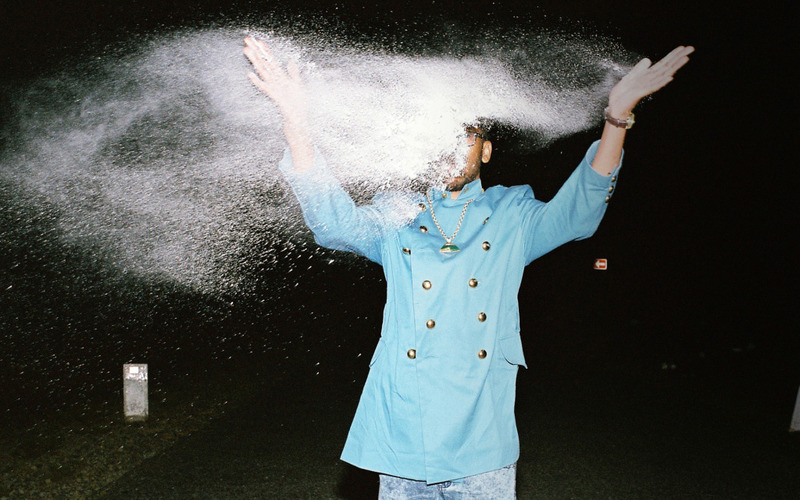 Nthato Mokgata, better known as Spoek Mathambo, is an afrofuturist electro-rapper from Johannesburg, South Africa. Initially influenced by '90s American hip hop, Mathambo began rapping at 10 and eventually made his way into the Cape Town music scene in 2003, where he would collaborate on The Fantastic Kill album with Sibot and Watkin Tudor Jones (of Die Antwoord). After a series of collaborations, as well as forays into graphic design and international DJ gigs, Mathambo released his debut album Mshini Wam in 2010 on BBE Records. The album showcased a new genre, coined "Township Tech," that mixes elements of dubstep, darkwave, post-punk and hip hop layered over fervent African rhythms. Signed in 2011 by the famous indie rock label Sub Pop Records, Mathambo released the Put Some Red On It EP in September and plans on recording with a live backing band for his 2012 sophomore LP. When Marilyn Monroe famously sang “Diamonds are a girl's best friend,” she probably didn't factor in the blood diamond trade in Africa—and that's where South Africa's Spoek Mathambo comes in. One year after the release of his debut album Mshini Wam, which included his dark gritty cover of Joy Division's “She's Lost Control,” Mathambo has released the Put Some Red On It EP. On it, the 25 year-old progressive electro-rapper paints a deeply politicized picture of South Africa. The EP's title track, written and sung with his wife Ana Rab, sheds light on the harsh reality of the diamond market through biting lyrics and bass-heavy, deep house beats: “You see her crawling and laugh at how proud she is,” Mathambo venomously flows. There are also two remixes of the song. The first has Machinedrum stripping the song down to minimalist beats and synths, with sparse shouts of “Red!” The second comes courtesy of Sub Pop label mates Shabazz Palaces, who chop up and manipulate the vocals so that “Reeeeddddd” sounds exceedingly mournful, before gradually repeating and raising the pitch of the phrase “Put some red on it!” By the end, it sounds like children singing, perhaps a reflection of child slavery in the diamond trade. “Dog To Bone” has a surprisingly breezy sound, with slightly Caribbean guitar riffs (played by young South African guitarist Nicolaas Van Reenen) and handclaps. However, a closer listen to the lyrics reveals that Mathambo is making references to the Soweto Uprising that happened in South Africa on June 16, 1976. More than 20,000 students protested at being forced to be instructed in the Afrikaans language (“pump it down these kids throats, choke the dream, let it die,” sings Mathambo), and nearly 200 people were killed (“doomed doomed doomed doomed doomed, your sons are,” Mathambo warns). Telepathe provide a remix of the song, with heavier house and electro beats. On his blog (2faced1), Mathambo calls himself a “post-apartheid post-hiphop posterboy.” Although his lyrics are distinctly insular to both past and current issues in South Africa, the music itself—dark electro colliding with hip hop beats and flowing rhymes—is strong enough on its own to warrant many listens. If Spoek Mathambo is the future of hip hop, we're definitely on board.